The town of Belchatow is included in the Lodz Area Research Group. 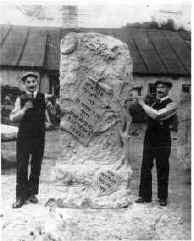 Please visit this site for further information on researching your Jewish roots in the Lodz region. You are invited to join the online mailing list. Welcome to the KehilaLinks Home Page for Belchatow, a small town in Central Poland (Latitude 51º 22', Longitude 19º 23'). During the time of the czars (Kingdom of Poland) it was located in the gubernia of Piotrkow Trybunalski. This site was created to share information on Jewish Belchatow and to commemorate the Jewish community that was virtually wiped out in the Holocaust. (Other spellings: Belchatov, Belkhatov.) This includes a small Jewish community that developed in nearby Grocholice (a village now part of Belchatow) that affiliated with Belchatow in the late 1800's. To begin exploring this site, click on a main topic to the left or click on Site Map here or on the bottom of each page. This book has been donated by Yehiel (Al) Volchik, grandson of Chil Lajb Przedborski, with the permission of Malka Yoskovich-Gilad, writer and daughter of Faiga Fella Przedborski Yoskovich Z"L, whose memories the book is based on. The book contains the original version written in Hebrew with English translation and inclusion of later photographs and family updates. Photographs and information from the book will be available on this page soon. The original Belchatow Yizkor Book in Yiddish is now online in digitized format on the New York Public Library's website. Translated chapters and photographs are available on the Yizkor Book site hosted by JewishGen. Latest new chapters include: "Belchatow 1914-1922" by Avraham Laib [added 12/11/2010] and "On the Border of Two Centuries" by Zalman Pudlowski [added 11/5/2011]. Menachem Sharon, Z"L, leader of the Belchatower landsmannschaft in Israel and former diplomat to Poland, donated a listing of over 6,000 names and birthdates of Jews living, or listed on records, in Belchatow before World War II. This list is now a searchable database on JRI-Poland. Click here to see a listing of the surnames in this database on JRI-Poland's website. The "Belchatow Holocaust Chronology" compiled by Sam Faivish, a survivor from Belchatow, for his book, My Story, © 2002, edited by Andrea Knight. A translation of the section on Belchatow from the 1929 Polish Business Directory Project of JRI-Poland in cooperation with JewishGen. Translation of J. M. Pukacz's reminiscences of Chaim-David Kaufman's Shoemaker Shop and home, including anecdotes about the daily life of poor Jewish Belchatowers, the silent movies at the cinema, baking matzoth, and other events. Blueprints for the "new" Belchatow Synagogue drawn up by the architect in January 1889. A list from the State Archives of 177 families who paid their contribution for the new synagogue in 1891. A list of the 112 candidates who ran for election to the Kahal's Jewish Community Council in 1936. In addition to their names and political affiliations, this list includes year of birth, occupation, and address in Belchatow for each candidate. A list of the 43 Jewish candidates who ran for election to the City Council in 1927. In addition to their names and political affiliations, this list includes age, occupation, and address in Belchatow for each candidate. A list of names and birth years of 593 children who were killed in the Chelmno Death Camp in August 1942. Translation of an article published in the Polish Slowo Zydowskie [Jewish Voice], in 2001. It discusses Jewish publications in the Belchatow/Piotrkow Trybulnalski area. Two documents found at the USHMM list the Holocaust survivors from Belchatow who went to Lower Silesia (Dolny Slask) after the war and formed a Landsmannschaft there. The translation of the section on Belchatow from Pinkas Hakehillot Polin is online, on the Yizkor Book Project site hosted by JewishGen. According to its Preface, this book, written in Hebrew, " is the first in a series of volumes dedicated to the Jewish communities of Poland and is part and parcel of the Pinkas Hakehillot project, whose aim is to establish a memorial to European Jewry which was destroyed in our lifetime." Visit the website dedicated to the Jewish Survivors of Belchatow, containing photographs provided by the families of people in them. Several of the survivors pictured have strong desires to identify and hopefully locate their fellow Belchatowers who shared their growing-up years as well as the horrible years of the Holocaust experience with them. This site is set up to respond to that desire and hopefully to provide faces to those descendants researching their roots in Belchatow. Read about Andrzej Selerowicz and his new website, which contains an interactive street map of Jewish homes in Belchatow in the early 1900's. NB: Volunteer translators are still needed to translate into English many chapters of books and journals about Belchatow originally written in Yiddish, Spanish, or Polish. Click here for the JRI-Poland Projects for Belchatow. Click here for JewishGen Searchable Databases. Click here for Historical Records in the Central Archives in Poland. "Belkhatov Without Jews" on the Yizkor Book Project site hosted by JewishGen. including pieces of his father's tombstone. Click here to see other photographs taken in Belchatow before WWII. PSA (Polish State Archives Project) -- search for "Belchatow"
JewishGen Family Finder: Search by surname or town. We strongly urge you to go to the JewishGen Family Finder site to register the surnames and places you are researching. This will provide you with the opportunity to contact others with an interest in those same surnames and places. We also strongly urge you to contribute to or update your family data in the Family Tree of the Jewish People. Would you like to connect with others researching BELCHATOW? Click the button to search the JewishGen Family Finder database. Yizkor (Memorial) Books written by groups of former residents of the towns are wonderful sources for learning about life in these towns before and during the Holocaust. Search the entire JRI-Poland database of Jewish birth, marriage, and death records by surname and town. Search The Central Database of Shoah Victims' Names on the Yad Vashem website. This site is hosted at no cost to the public by JewishGen, Inc. and is part of the KehilaLinks Project. If you find this site of value, your Jewish Gen-erosity is greatly appreciated. This site last revised on April 15, 2013. Copyright © 2001-2018 Roni Seibel Liebowitz. All rights reserved.